401k plans can help you recruit and retain employees, and benefit your own long-term savings. Learn how to make these plans a winner for both you and your employees. 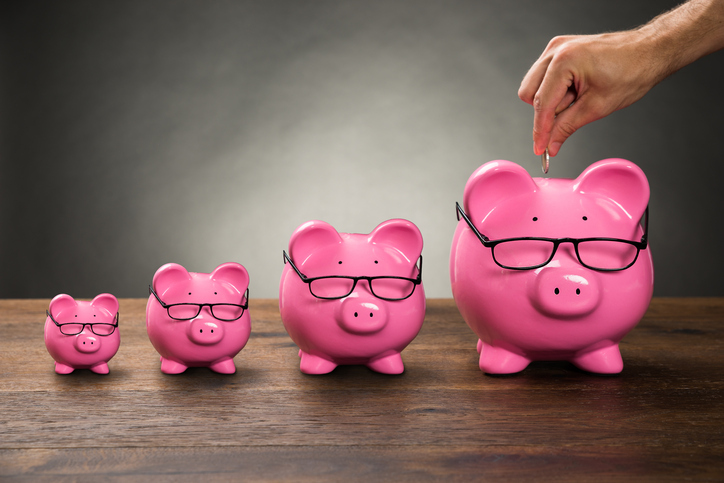 Here is how to find the right 401k for your practice, including the difference finding the right plan made to an optometric practice I worked with, and an action plan to help you do the same. 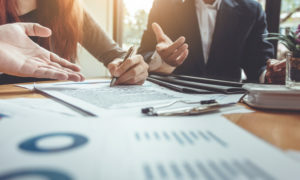 The 401k is a great piece of tax code, allowing an employer to offer tax-deferred retirement savings plans to employees, and offer employer contributions, but the problem lies in the method by which 401k plans are sold — and the surprising number of hands in the retirement plan pie. Over the past three decades, 401k plan providers have been making big money through hidden or opaque fee arrangements. In fact, it took a full 30 years before the industry was required to disclose just how much they make on your plan. Typical asset-based fees for 401k participants range from 1.25-3 percent. Only since 2012 are they now required to produce a fee disclosure document (known as a 408b2), that optometry practices and other plan sponsors are required to review, articulate, and take action upon if necessary, yet the actual fees are often buried in fine print. And so we have a business model where nearly all the major plan providers are conflicted. They choose funds for your plan that charge hefty fees so that there is plenty to go around (or worse, they just sell you their own name-brand funds, which are more profitable for them). Did you think the funds were chosen because they were the best performing? Think again. They were probably chosen because the fund company will “pay to play”— which is why superior-performing, low-cost index funds tend to be a rarity in 401k plans. But it doesn’t stop there. The broker who sold the plan wants his cut. So, he, too, will receive commissions from the funds, or simply layer on additional fees. And let’s not forget the third-party administrator. They typically charge a fee directly to the employer, but many will also accept a portion of the mutual fund fees. This often buys their loyalty to specific providers. The net result is an industry with layers upon layers of incestuous relationships that funnel excessive fees from your plan, and puts numerous conflicts of interest in play — hence the lawsuits. Joel B. Hayden, OD, owner of Hayden Optometric Associates in Mansfield, Mass., knows this all too well. When he first looked into setting up his practice’s 401k plan for himself and his employees 14 years ago, he wasn’t sure how to find the right plan, and went to his neighbor, who works in financial services, for help. The neighbor acted as advisor to Hayden Optometric Associates, convincing Dr. Hayden to choose a plan offered by the practice’s payroll services provider. Dr. Hayden agreed with his neighbor’s argument that having one company manage his practice’s payroll services and retirement plan would make matters much less complicated. The plan provider charged Dr. Hayden and his employees, the participants, annual fees that totaled 4 percent of assets under management. Although the fees your plan charges might sound like small percentages, like the 4 percent fee that Dr. Hayden’s plan required, they have a massive impact over time. Fees subtract directly from your returns. John Bogle, founder of Vanguard, says that costs can cut returns by 66 percent over the course of our saving years. Said another way, simply controlling costs could double your future nest egg in size. It wasn’t until Dr. Hayden read Tony Robbins’ book “Unshakeable: Your Financial Freedom Playbook,” which discussed the 401k fees that most employers and employees pay, that he realized he and his employees were paying unnecessarily high fees which were eating away their savings over the long term—and that his neighbor had incentives to steer him toward certain plans. Dr. Hayden then went to the online 401(k) Fee Checker tool that my company, America’s Best 401k, developed, where he was able to compare the fees his practice’s plan charged to the lower fees for other plans in the marketplace—and calculate how much he and his employees could save. Six months ago, Dr. Hayden switched to one of our plans (as an aside, he also switched to a different payroll manager to make the plan transition more seamless). His personal 401k balance has increased by 7 percent in that short amount of time. Dr. Hayden and his participants were able to reduce their total investment related fees to just 0.60 percent. In addition, when Dr. Hayden and his employees rolled their 401k account balances from the previous plan into accounts in the new plan, each balance was transferred in full. On the other hand, when Dr. Hayden’s office manager rolled her 401k savings into the previous plan, $10,000 was missing at the conclusion of the process—and neither the plan provider nor Dr. Hayden’s neighbor could figure out where it went. At first glance, you might be thinking these issues and conflicts should be the liability of the provider. After all, they sold you the plan. But ERISA rules make you, the employer, the fiduciary to the plan and to your employees. As the plan sponsor, it’s your job to make sure the plan is set up for the sole benefit of the employees. It’s your job to review and periodically benchmark your plan against other options. For many optometric practice owners, this is alarming news, as running a business is already challenging enough. ELIMINATE FEES. Eliminate layers of fees wherever possible. The first and easiest way to cut fees is to eliminate the use of a broker who is paid by commission. Brokers typically add little ongoing value short of bringing donuts to your office twice a year to keep everyone happy. 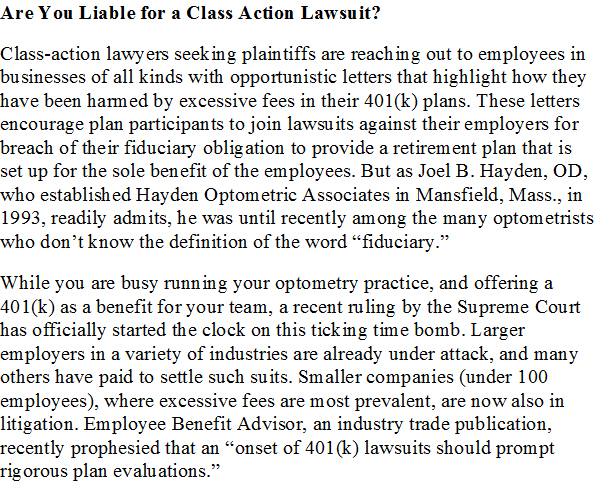 Like Dr. Hayden, many employers were sold their plans by brokers who may also be personal friends or acquaintances. Breaking up is hard to do, but a personal relationship is not a defensible position with the Department of Labor. REMOVE CONFLICTS OF INTEREST. If you are using a plan where the provider is being paid by the mutual funds in the plan, they have an inherent bias to select more expensive funds or sell you their own name-brand proprietary funds. This is nearly always the case with plans offered by insurance companies, payroll companies, or mutual fund companies. You can simply ask your provider if they are “revenue sharing” with the mutual funds they offer. USE THIRD-PARTY FIDUCIARY. Install a third-party fiduciary on your behalf. This is known as a 3(38) fiduciary, who will take over nearly all of the responsibilities and much of the liability of the plan sponsor. Their job is to make sure that the plan is continually operated in the best interests of the plan participants. This is a best practice adopted at many Fortune 500 companies, but is rarely seen in small- to mid-size plans. FIND LOWEST-COST INDEX FUNDS. Look for a plan that has access to the lowest-cost index funds. Index funds consistently outperform nearly all actively managed mutual funds over the long term. One note of caution: Many providers don’t make money off these funds due to their rock-bottom fees, so they sometimes charge additional layers of fees, or they will say your plan isn’t big enough to qualify. Nonsense! Every 401k participant in America should have access to the same low-cost funds regardless of the balance in their company’s 401k plan. Dr. Hayden has an additional piece of advice for his fellow optometric practice owners—he says they should enhance their financial literacy. The 401k is an amazing retirement solution when there is alignment between the provider and the saver. It’s time that Americans wake up and take back their retirement plans from the providers that have been milking them for every dime they can get. It’s time for independent optometrists to feel proud of the plans they offer, knowing that they will give themselves and their employees the absolute best chance at a successful retirement.